Design your own black and white canvas to give your room that effortlessly cool décor. In sizes all the way from 30 x 30 to 200 x 200cm, you can create black and white wall art for both those small alcoves and big feature walls above the fireplace. No monochrome photos? Our design system can convert your colour pictures for you. Design your own black and white canvas for a super chic wall hanging that goes with any colour scheme. 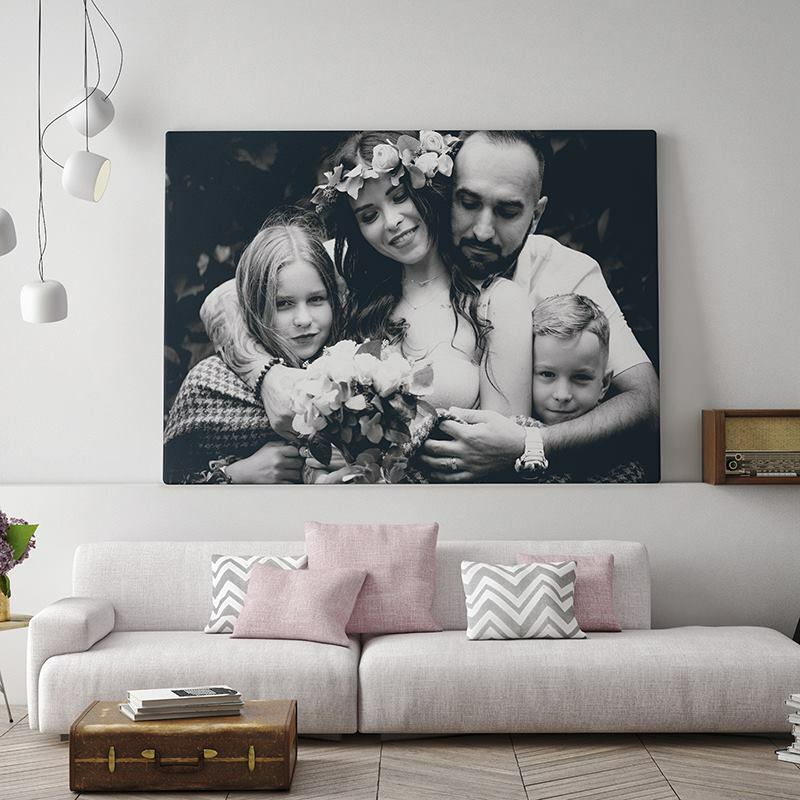 Any photo looks amazing when printed in monochrome, whether it’s a family portrait or a picture of your pet, so treat your home to some black and white canvas art. If you don’t have a black and white photo, fear not. Our image editor can convert your colour photos for you. A beautiful canvas of my daughter. These guys have the best customer service and always go the extra mile. Highly recommend them! Your custom black and white canvases are all handmade to order. Our specialist digital printing processes locks the greyscale colour into the white canvas for a permanent print that won’t fade. We hand trim the canvas fabric to size and mount onto our custom FSC wooden frames to meet your bespoke size. Your black and white canvas is high quality, built to last with reinforced frame corners and smooth fabric face. Your canvas is sent fast and will be with you in just a matter of days. Choose your height and width dimensions separately, so you can create the right sized black and white canvas for you and your home. This means you can create square, portrait, and landscape canvases that meet your needs. You can also select which depth size you want, either 2.5cm or 4.5cm, along with a choice of three image wrap styles. Mirror wrap: The part of image near the edge is mirrored and used to wrap around the frame. With this wrap your whole photo is visible on the canvas front but with a gallery wrap appearance. Colour wrap: Your photo or design stops at the edges are the sides are wrapped in a colour of your choice. Transform your favourite wedding photo into a demure black and white canvas print. This is a popular filter because it shows off your beautiful white wedding dress. As a personalised photo gift for your Mum and Dad’s anniversary, or your friends’ engagement, choose a cute nostalgic photo from when they first got together. For a contemporary take on the classic pet portrait, turn it into a striking piece of black and white canvas art. On a solid colour wall, this will look stunning. Any animal lover would love this hung up in their home, taking pride of place above the fireplace. Or create a black and white photo collage featuring their beloved pet.